Intrigued by a new series from Lisa Renee Jones, Lilah Love popped up to fill that promise. Lilah is a profiler for the FBI, and a string of murders that stretch across the country will test her skills and her courage. She’s driven and intelligent, with a knack for out-thinking suspects using her experience and training to stay one step ahead. She’s moved on from her family and their expectations: raised in privilege she’s taken a big leap away, and truly never was interested in returning. But, this current case is raising red flags and a trip back to the Hamptons where she grew up just may be needed. If only the anonymous threats, and the worries that the trail will lead her to her ex and the only man she ever loved: Kane Mendez, son of a major crime boss. Of course, when you add in her own connections to the town’s management; her father the mayor, her brother the Police Chief and, of course, the connection to the illegal crime boss’s son. There are plenty of worries in her return, and even more secrets that she wants to forget. Full of secrets, tension and more twists than should be allowed, the story ends on a cliffhanger with many elements yet to sort out. Trademark LRJ writing: the secrets and tensions all play into the action, as questions about Lilah, the killer and her own hidden past are asked, with answers coming in dribs and drabs, each bringing forward more questions and possible solutions to the mystery. A clever start for the first in a series, sure to please fans of the author who are not daunted by the wait to have the cliffhanger resolved. 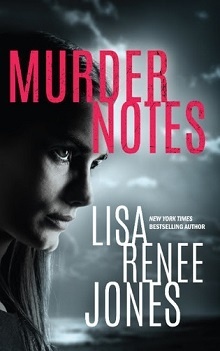 New York Times bestselling author Lisa Renee Jones’s heart-pounding thriller of a woman’s secrets—and a past that’s about to come out of hiding . . .